A Commentary on Fra Angelico's "The Baptism of Christ"
From left to right in Fra Angelico's painting there are six human figures: two angels, Jesus, John the Baptist, Mary the mother of Jesus, and a Dominican friar. A Dominican friar? Impossible! 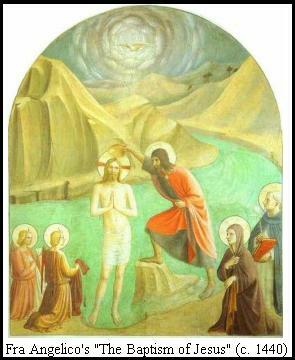 Jesus was baptized somewhere around 25 A.D. to 35 A.D. The Dominicans did not come into existence until the early 13th Century, more than a thousand years after John baptized Jesus. There is absolutely no doubt that the sixth figure is a Dominican friar. He is wearing the white cassock (clerical robe) and the hooded black cappa (clerical cloak) which gave these monks a rather sinister and spooky look whenever they covered their heads with their hoods and which caused Englishmen to call them Blackfriars. Although Fra Angelico's paintings depict a number of Dominican friars and nuns, usually the depictions are of Saint Dominic, the founder of the Dominican Order of Preachers. By the way, the best-known Dominicans from history were the founder Saint Dominic, the philosopher Saint Thomas Aquinas, and the Grand Inquisitor Tomas de Torquemada, who most definitely was not a saint. And, of course, the painter Fra Angelico himself, who began his artistic career as a copyist and illuminator of manuscripts at a Dominican monastery in Fiesole, Italy, in the early 15th Century. Angelico, alas, is also not a saint though he has been considered for that honor, and has made it part-way to sainthood. His official title in Catholic circles is the Blessed Fra Angelico. So why is 13th Century Saint Dominic in a 15th Century painting of an episode that occurred in the 1st Century? And how do we know that the friar depicted is Dominic? Notice that the friar is holding a red book in his left hand and a pen in his right hand. This is a visual allusion to a miracle attributed to Dominic. As the story is usually told, in 1207 Dominic was given the task of burning some heretical writings of the Albigensians. In order to prove that the writings being burned were in fact full of errors, Dominic put a book of his own in the fire. Dominic's book was so full of truth that the fire miraculously did not harm his book; meanwhile, however, the heretical books were burned to ashes. In memory of that event, nearly all pictures of Dominic show him holding a book and a pen.